What's happened -- somewhere in the mind -- during the hiatus? It seems to vary. Maybe I've decided there's an opportunity to enrich the storyline, perhaps with whole new subplots. That's common. Maybe I've thought of ways to strengthen the ending -- with ripple effects back to the beginning. Sometimes, when I've tried to pick up just where I had left off, I've discovered that a character has used the alone time as an opportunity to flesh him/herself out, or object to some action I had had in mind for him/her ("Really? I wouldn't do that"), or clamor for a bigger role. When one sets a story in another time, or on another world, or involving a non-human intelligence, verisimilitude demands scattered snippets of creative, supporting background. They're often throwaway. Often I've seen in hindsight that such a bit of background is so cool, with so many prospective implications, that I can't resist expanding that bit into a major part of the story. And sometimes, when the interruption has been long enough, I've simply mastered enough new tricks of the trade to micro-edit the old draft into something better. Case in point: In 2006, immediately after Larry Niven and I sent our agent the completed MS for Fleet of Worlds -- written on spec -- I began what would become InterstellarNet: Enigma. You can see why I set aside the opening of the future InterstellarNet: Enigma (then with the working title The Matthews Conundrum). I didn't get back to this interrupted project until 2012 -- at which point I had an epiphany. With a bit of rework and a tweaked ending, that first segment might be shaped into a standalone story. As a novella, "The Matthews Conundrum" ran in Analog (November 2013) -- and it's a personal favorite among works of my own writing. It inspired me to reexamine "What comes next?" The answer to that question, "Championship B'tok," also went into Analog (September 2014) and garnered a Hugo nomination. While all that unfolded, I worked out more and more implications of my imagined (dare I call it enigmatic ;-) ) alien technology. And at the end of the process? 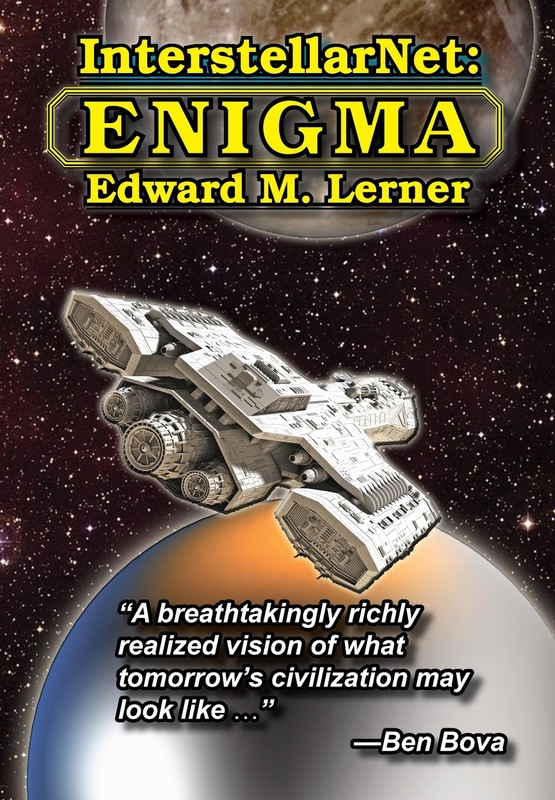 When InterstellarNet: Enigma -- a novel begun, I remind you, in 2006 -- finally made its appearance this year, it was, IMO, far better for the twisty path it had taken. Some would ask -- and fair enough: if first starts are false starts, why bother with detailed planning like an outline? I expect to stick with my process. I'll start every novel with an outline -- secure in the knowledge that it works for me, not the other way around. And when time permits, or circumstances dictate, there will be a pause after the writing is well underway. What about the stuff that I write and then take out? Elements of plot that have been overcome by events? I save them all -- and sometimes they pop up in other contexts. Dark Secret, my 2013 serial in Analog, is a post-apocalyptic interstellar epic. I had that novel going toward a particular conclusion, but after awhile (and time away for another project), some of the characters, or my subconscious, or an aesthetic sense -- or the lot of them -- staged an intervention. It became clear to me that a different, more character-oriented, ending worked better than what I'd had originally in mind. That said, I never forgot the existential technological dilemma with which I had once planned to confront humanity's desperate few survivors. Is there a story in one of these? So: I'm happy with the new route Dark Secret took along the way and I'm happy that the few dozen pages of draft I backed out continued to ferment. (You do remember the wine motif to this post, right?) I'm pretty sure that a novelette or novella is going to emerge from what I had set aside.